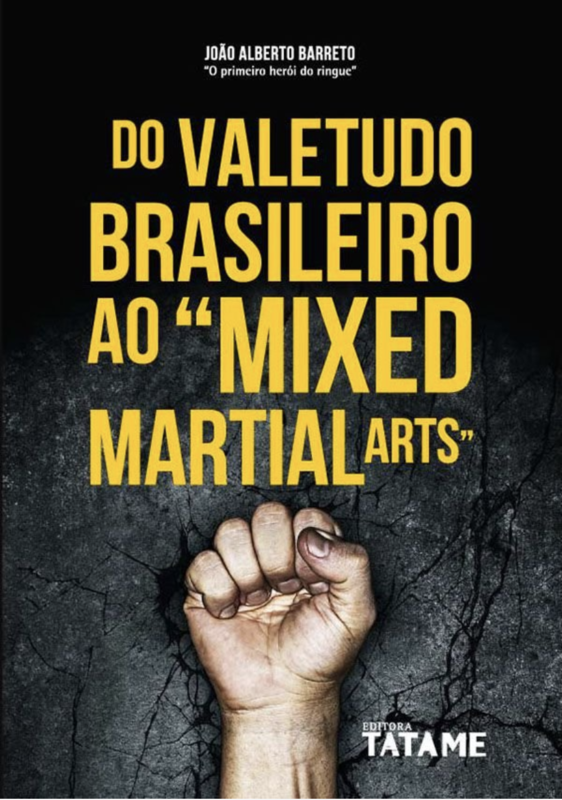 Do Vale Tudo Brasileiro ao "Mixed Martial Arts"
It is seldom for a book on martial-arts to be written by someone with so much credibility as well as such an enduring history in their art. João Alberto Barreto's (hereafter JAB) resume is long: the first “Heroi do Ringue”; one of the first non-Gracie instructors of the Gracie academy; one of the founding fathers of “Vale-Tudo” (modern MMA); academic; author; one of the original UFC referee’s as well as fight promoter. A long and respectful resume by someone who lived as well as witnessed what was, arguably, the greatest revolution in the history of martial-arts. Standing in a unique position to interpret the evolution of “Valendo Tudo” into a global phenomenon of both practitioners and spectators, Barreto writes for a younger generation that knows little about this evolution. In addition, he writes his own understandings of the sport as it is today as well as his method for success in the cage/ring. Do Vale Tudo Brasileiro ao "Mixed Martial Arts" is divided into five chapters. Chapter one deals with the birth of Vale-Tudo as an art, its progression and its culmination on the international stage through the creation of the UFC. Next, the author takes us through this evolution as he divides them into a series of acronyms he uses to define different stages of this same evolution. The third and fourth chapter deal with psychological aspects of combat in which he makes no short usage of his experience as both, a sport psychologist and fighter. In the final chapter, Barreto presents to us his “JAB Method” for physical, technical and mental preparation for aspiring fighters. The initial chapter on the history of this development, holds no novelties since it repeats commonly held misconceptions and myths regarding the development of both BJJ and MMA in Brazil. From the purpose of Maeda’s trip to Brazil, to his early teachings of Kodokan Judo in Belém, to unfounded stories about Maeda himself (like the one where Maeda won a fight against an opponent by simply shaking his hand. The hand-shake, having the power to subdue his opponent there and then). Other inaccuracies are the commonly held and widespread myth of Helio Gracie’s weak physique as well as a match between Helio and Geo Omori that never took place (his brothers Carlos and George were the ones that fought Omori), as well a fight between Carlos Gracie and a man called “Samuel” that has no record of ever occurring.1 Also, the assault by the Gracie brothers on Manuel Rufino dos Santos as well as referring to the Helio Gracie and Waldemar Santana fight as the first Vale-Tudo fight in Brazil, to mention a few. In the author’s defense, the book is not a historical work nor does it ever claim to be. Following this, JAB begins a chronological dissertation of the evolution of Vale-Tudo in Brazil. From the creation of the television show “Herois do Ringue” that featured the first Vale-Tudo fight broadcasted on television, and with JAB himself as the star of the show, to the events that exploded around the world following the creation of the UFC by Rorion Gracie, John Milius and Art Davie. JAB is also careful to give due credit to the main figures of this phase that catapulted Vale-Tudo in Brazil from a marginalized and niche practice to the center stage of global attention. In chapter two, the author presents the reader with a series of acronyms to explain his different interpretations of the state of the sport as it evolved over time. They are: Valetudo Global (VTG); Arte-Marcial Integrada (AMI); Valetudo Brasileiro (VTB); Sistema Globalizado de Lutas (SGL); Luta Livre Americana (LLA); Vale-Tudo (VT) and, of due course, MMA. The author makes loose differentiations between all these acronyms which aren’t always clear and sound rather confusing to the reader since much of these differentiations seem redundant and unnecessary. Here the author presents us with one of the cornerstones of his thesis, namely, the usage of “machucação” as a drift from what the author considers to be the premise of combat: to win by submission, KO or TKO. JAB elegantly coins the term “machucação” (which I will loosely translate as the “hurting” of the opponent) to describe his disagreement with the judging system that prompted fighters to win the round by points rather than decisively. According to JAB, the excessive usage of this “hurting” is not merely a drift from the purpose of combat described above, but also the unnecessary damaging of an opponent without practically winning. Regardless, of what one thinks of his rationale, the author makes his point in a rather lucid and clear way, giving the reader food for thought. The chapter extends into the author’s views on what the effective tactics for modern fighting are. From striking, (where the author insists in the assimilation of Capoeira into the repertoire of modern fighters), to the clinch, to the ground (where he insists, lucidly, in the top position as the de-facto dominant position in a fight), as well as other tactical preferences he recommends for the aspiring new generation, which he divides into “well-doings” and “wrong-doings. Some of it interesting and thought provocative others well within common sense, yet others, technically questionable for modern combat at the highest level. JAB also makes a good point in regards to the current MMA ruleset (one that I share with him in fact). If modern MMA is to be a laboratory for efficient combat techniques, that is to say it is meant to be “as real as it gets”, so long as the fighters health integrity is preserved, then what follows is that all efficient techniques should be permitted, including kicks by a downed opponent on the top fighter (regardless of the latter being standing or kneeling). A prohibition I have yet to hear a good argument for. The chapter finishes with a quick gloss over the role of the referee, trainers and the media. Next, JAB is at his best and well within his field of domain: Sports Psychology. Speaking not only with the authority of a psychologist himself, but as a former fighter (and pioneer at that). Going over the many different emotional aspects a fighter must learn how to cope as well as instructing the reader how to prepare for such situations. He aptly describes what he calls the “path to sports excellency” (O caminho da excelência esportiva) as: talent, aspiration, discipline, commitment, perseverance, non-conformity (with current status), motivation, courage, extreme training, confidence, joy (in what you practice), overcoming limits, humbleness, affirmation (of individuality), responsibility, un-comfort zone (by creating these in practice), be aware of “traps of success” (that can sway you from your target) and control of performance (to always seek excellency). He gleams when he speaks of the above. Like when he writes of the necessity for a fighter to “stay out of his comfort zone” in practice or when he speaks of the genetic endowment playing a role not merely in regards to physical abilities but being determining, alongside nurture, in mental abilities as well. If he errs at all in these chapters, is not exploring more thoroughly these fundamental aspects of the psychology of fighting. He finishes these chapters with very helpful drills for relaxation and visualization in preparation for a fight. Lastly, JAB describes his training method: “O Método JAB (João Alberto Barreto) de Treinamento.” In many ways it is a continuation of the end of chapter two where he makes a critique of the current technical state of the sport and gives his own suggestions on how to remedy this. To avoid combating without a clear objective, the surpassing of one’s own limits, logic, knowing how to fight with an efficient guard and the dominancy of the top-position are at the center-stage of his method. The author outlines fifty-eight situations common to modern MMA and points out what the objectives should be when the fighter finds himself in these situations, such as: getting to know your opponent as much as possible, his physical, technical, tactical and psychological characteristics (#6); a blow to any part of the body can be, through pain and distraction, the best way to knockout your opponent (#42); and never give away what you are about to do, but surprise your opponent instead (#46). Many of these points fall well within the realm of common sense, while others aptly point out fundamental aspects in combat that are often neglected by professional fighters. Additionally, throughout his writing, JAB’s loyalty to the Gracie family and to favorites (in particular Dana White and John McCarthy) jump at the reader as he does not economize on flattery. Yet ultimately JAB’s book lacks a coherent pathway by which he lays down his expertise and opinions. The book meanders, is often redundant, makes excessive usage of acronyms which conceptually overlap one another, makes excessive use of complex language that is inaccessible to much of the targeted public, and often back-tracks on points that were explicitly explained in detail in previous pages. All in all, “Do Valetudo Brasileiro ao Mixed Martial Arts” is a compendium of thoughts that encompass the technical, the physical as well as the psychological by a man who has guaranteed his name as a founding father of an art that has become a global phenomenon. The appropriately describes Brazilian Vale-Tudo (VTB) “as a new modality (…) simply the most efficient one on the planet.” For this, JAB deserves our respect in contributing to the creation of a laboratory (as he describes the cage/ring) that has been consistently perfecting martial-arts for almost a century in its long journey from Japan , to Belem and to the World. JAB is a living conduit of this epic living and developing history. 1. Concerning the supposed fight with "Samuel", see here. (c) 2018, Robert Drysdale. All rights reserved.